“You do not expect this level of service when you see this building”, — the expert from the European Union Advisory Mission, Felix Gautsch said during his visit to Vinnytsia’s ‘Transparent Office’. “But you can easily imagine yourself in some European countries when you enter it”. He was rightly impressed: Vinnytsia is a leader in bringing e-Governance to its people with the aim to be more transparent and accountable. The City council has refurbished the first floor to build glass walls of ‘Transparent office’, that provides 300 administrative services based on one stop-shop principle. More than 3,000 people use one of the city’s four service centers to access automated public services, including real estate and housing transactions, school enrollment and local residency registration. 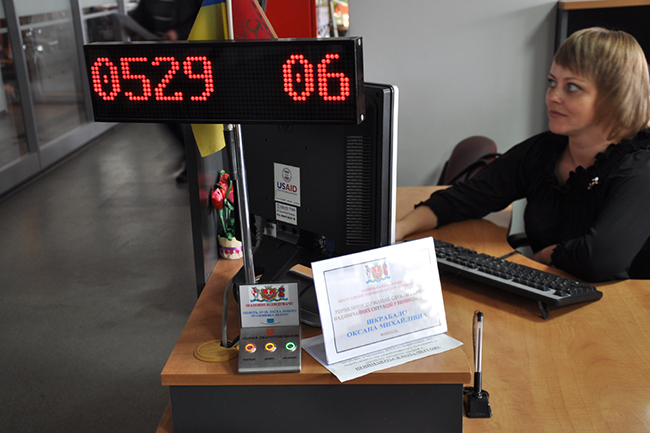 The various e-governance tools to provide public services have resulted in the reduction of waiting times to 5-7 minutes compared with 23 minutes on average previously. In addition, surveys on customer satisfaction show that almost 60 percent of respondents consider the work of the offices to be fair and non-partisan (report by the Swiss Agency for Development and Cooperation). The main reason to establish the transparent offices was that Ukrainian authorities were often perceived as inefficient, bureaucratic, and corrupt. E-governance is seen as a tool to better organise public services and make them more effective and transparent. But for them it is also about providing information and services for the entire population: “One of our priorities is to provide access for disabled people”, the Head of the Department, Iryna Kopchuk, proudly says while showing ramps and special electronic panels. Though the building of the council is lively and full of people, it is not overcrowded, as there is a e-ticketing in place. Apart from that, they apply restrictive measures to minimize corruption: Staff members that receive documents do not make decisions, which helps to avoid conflict of interest. Moreover, surveillance cameras monitor the activity of workers during working hours. This year, the transparent office also received the Gender Award from the Swiss Confederation. They said that they were “pleasantly surprised to learn that the transparent offices have nurseries where mothers can leave their children temporarily until they have received the services”. Mothers and dads of the ‘Transparent office’ may also leave their children in these rooms, whenever there is a need for it. EUAM administration reform experts Laidi Surva and Nadiya Tretyak had an open and fruitful discussion with the Head of the Transparent office, Yevhen Ishchuk. The EUAM guests voiced their hope for better cooperation between the capital and regions and noted that Vinnytsia showcases a good example of a citizen-oriented approach.